UNO & Friends is a pretty fun game for Windows Phone, Tablet, and PC. This morning, an update was pushed out for both the Windows smartphone version and the Windows tablet and PC version of the game that presents a new game mode called “UNO Dare,” which is being offered to players for a limited time only. 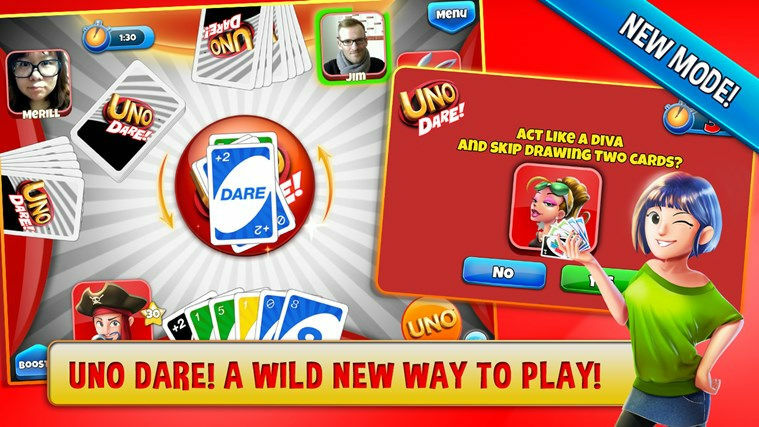 UNO Dare allows you to skip the dreaded “Draw 2” cards, but only if you’re willing to accept a “dare.” You’ll be able to collect new avatars, win exclusive rewards and more. Enjoy a new twist with a NEW MODE: UNO Dare! Available for a limited time only! Skip drawing cards whenever a Draw 2 card is played — but only if you accept the Dare! Collect wacky NEW AVATARS in UNO Dare to receive special bonuses whenever you have them equipped, in any mode! Get the chance to multiply your rewards or WIN EXCLUSIVE REWARDS by spinning the UNO Dare wheel at the end of each UNO Dare game! Download UNO & Friends via the QR code above if you’re playing on Windows Phone. For Windows tablets and PCs, download the game through the Windows Store here. Pretty massive update! I love it! Good find! I only have one cheeve left on Uno, (level 100), any news on the Windows 8.1 version update? following the update the Level 100 achievement unlocked! im a happy bunny!